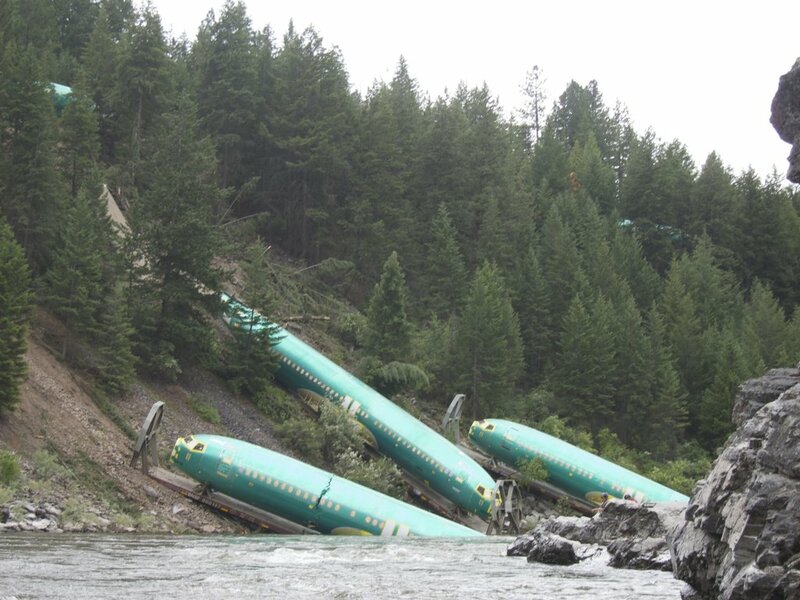 Seems BNSF (Burlington Northern Santa Fe) suffered a train derailment today, spilling three Boeing 737 fuselages into the Clark Fork River in Montana. See this link for more details and photos. There is no information as to which versions, or the intended customers at this time. And there is no truth to the rumour that Alaska Airlines in talking to Boeing about adding three airplanes to their Salmon-three-Salmon fleet…. at least…. not yet. Update 10/21/2014: Apparently all the fuselages that derailed have been scrapped. Boeing, and probably their insurers, are not willing to deal with the potential for legal problems should one of them ever be involved in any kind of incident. This entry was posted in Civil Aviation News and tagged Boeing 737. Bookmark the permalink.